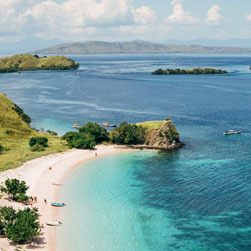 Lombok is a quieter alternative to neighbouring Bali. The main attraction are the Gilis, a trio of islands off Lombok’s northwest coast. World-renowned for their turquoise waters, white-sand beaches, and amazing snorkelling and diving sites, the Gilis each have something unique to offer. In contrast, the island of Lombok is home to Mount Rinjani, Indonesia’s second tallest volcano, as well as lush forested mountains including and rice field villages, ideal for gentle or adventurous trekking. Lombok International Airport is located near the capital city of Mataram.